I've seen some of you rockin' the Heidi braids before but I could never get it to work. I assumed my hair was too thick (I am not complaining about that) and that the layers that I am trying to grow out were getting in the way. Yesterday I watched one of Strawberry Koi's videos and it all clicked, finally! Her videos are so fantastic and helpful... I think I'm going to try pin curls tonight! Thank you, bloggers, for being the (younger) big sisters I never had & teaching me the tricks I need to know. Oh, your new glasses look so great! I really love them, and the braids..and these photos of you. So pretty! 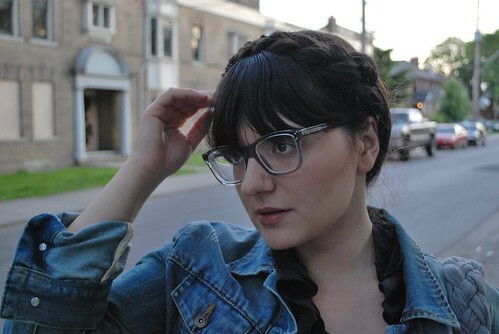 I first tried wearing my hair in Heidi braids a few weeks ago, and I've done it a few times since! My hair is also very thick; the sheer weight of it can cause the braids to fall down. I'm excited to check out the tutorial to see how I can improve my technique. Your Heidi braids look great. I think they really suit your face. I like your new glasses too! Haha, it was quite the same way with me, I just can't do much with my hair, but that video really helped. You look lovely and I really like your new glasses! You're totally rocking this look! And I think I'm liking your glasses even more. you look so cute! i cannot wait to try this style. i've been experimenting more with hairstyles instead of leaving it flat. shucks! i am so proud you are a Louche carrier. i love the heidi braids echoing the strap. you look great. the folded back jean jacket cuffs, nice. I've been digging a braids group on flickr!! My hair is too thin for it. but i shall never give up! thanks for the recommendation to check out the video! I intend on trying it out with this new tutorial. your new glasses look fabulous and so 'you'! i am trying my best to come up with something interesting for braid wednesday. i should have bought more hair pins at target, i have a feeling i'm going to need them. Oh, I envy you your Swan bag! I love her things, she's so talented. I love matching the hair to the purse. Very cute. 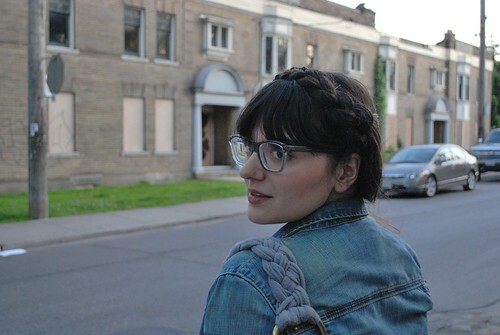 I did the Heidi braids this weekend and I love them! I received so many compliments and felt amazing. It's such a nice 'do for summer. Thanks for showing me how to do it. wow, you look gorgeous. the glasses are perfect!